The flagship portable solar charger in the PowerFilm line devoted to AA battery charging. PowerFilm's AA Solar Charger works to keep 2 or 4 AA rechargeable batteries always at the ready. Ultra compact, ultra lightweight and yet very durable, the PowerFilm• AA Foldable Solar Charger is ideal for everyday use. Charging either 2 AA batteries in 3.5 hours of full sun or 4 AA batteries in 7 hours of full sun, the AA Foldable Solar Charger provides highly effective battery charging. Proprietary charging circuitry maximizes charge into the batteries, and charging lights indicate charging status and charge completion. Unlike "CIGS" solar technology, PowerFilm A-Si solar modules do not need to be "sun soaked" after storage, they provide critical power immediately when placed in the sun. The lightweight and durable PowerFilm flexible solar panels are integrated directly onto the fabric, keeping the weight of the charger to less than four spare batteries. Six grommets are built into the charger to allow for secure fastening to a pack or to the ground. 1. 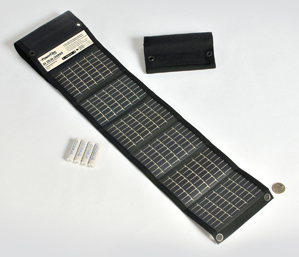 The 1.5 watt solar panel charges 4 AA (included) batteries in 6 hours or less depending on the level of charge in the batteries. 2. Once charged, the AA batteries are ready to be placed in any device running on AA batteries. 3. Can be used to charge 2 or 4 AA batteries (charge time for 2 batteries is reduced).